If you haven't played Titanfall yourself yet, you may be one of those wondering: what the hell is with all the hype around that game? It's just another shooter, right? Not quite. It's better. I'll admit it—I'm one of those people excited about Titanfall; one of those people who can't stop talking about Titanfall or telling her friends to start playing the beta with her. Who keeps saying that this is what first-person shooters have been missing. That it's a reinvigorated first-person shooter. And it's not just about the Titans (although it's very much about the Titans). Let me explain, at least from my perspective, why this hype is justified. NPCs? What? Hear me out. There's a lot of action going on in a Titanfall multiplayer match, but not all of it is controlled by human players. Each team gets a group of computer-controlled teammates. Enemy fodder in the form of grunt AI means that less skilled players can keep up with everyone else. You're not stuck watching kill cams of people demolishing you with far superior weapons, realizing it'll take you ages before you can level up enough to get your hands on one of those. You don't feel hopeless playing Titanfall. You feel encouragement. Every goal—every weapon you lust over—is one that excites you, not that you dread just thinking about. Every kill—even the easy AI ones—gets you closer to leveling up and therefore closer to those unlocks. So even if you can't seem to kill other pilots with the frequency as those players on the top of your team's leaderboard, you can still get a feel for success on the battlefield. One thing is true of all first-person shooters: the more you play, the better you get. But as opposed to a series like Call of Duty where the thought of getting shot down every round without so much as getting to mutter a curse of outrage in before it's stifled, Titanfall gives you some amount of reward while playing. It's still challenging and there's still room for competition without completely dismissing players who can't quite handle the game on that level just yet. And if you're just too good for the grunt kills, they're easily avoidable and identifiable on the map. It's better for everyone. 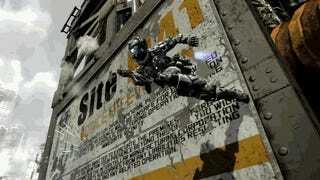 Titanfall takes the typical run-and-gun experience and turns it into something of a battle ballet. You can run on a slant against walls, double-jump with a jetpack and grab onto high ledges. Stringing them all together lets you practically glide through the maps. This is expert-level movement. 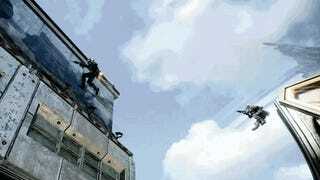 Instead of just running face-first or flanking your way to your target like in most first-person shooters, you can maximize the effectiveness of your knowledge of the map and of people's predictable behavior on it by zigzagging between buildings, from high up on their walls. You're not beholden to the layout of just the innards of buildings and obstacles on the field outside. You don't have to take on a Titan from a vulnerable position on the ground—you can sprint and crawl your way up buildings for the height advantage. Games like Brink have experimented with upwards movement before, but it's never quite been as well-executed as this. And it's a trend that I'm happy to see more of and hope to continue to be impressed by. Everyone can get into a Titan. From the moment the game starts a counter on the screen lets you know how long you've got until your Titan arrives. It's not one of those elusive gold medal achievements that only the best of the best can grab. Sure, the more you kill, the more time gets knocked off your timer, and the faster you can get your hands on your big metal suit. But the important distinction here is that everyone gets a chance at rampaging around in the game's best, most powerful weapon. You're not limited to experiencing the game based on the confines of your skill level. Of course, the better you are the more the game will open up to you—that's just the nature of any multiplayer experience. It's fun at the top. But making sure everyone has a shot at the game's best feature is one of the game's smartest design choices. Even if you're not in a mech you still have a chance at taking one down as a lowly pilot, too. You can leap onto the mech's back and shoot the wiring in its head until it falls to its knees or work your way up a tall building to call up an anti-titan RPG to shoot the hell out of it from a safe distance. Power is an open opportunity for everyone, and it's never crippling but rather overpowered in the best of ways. 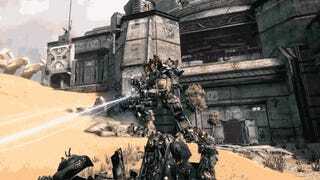 Titanfall is accessible, but not in a way that ostracizes its more skilled players. Think about it: what is the most cited reason people stay away from playing even well-made first-person shooters? It's an easy answer, everyone knows: all those 12-year-olds we like to joke about who have way too much free time to practice. It puts adults with maybe a spare hour or two to play at a huge disadvantage. And it's just not fun playing on an uneven field. So a well-made game feels like a bad experience. How can that be, right? It doesn't really make that much sense. Or at least it shouldn't. But Titanfall seems to have found a way to bridge that gap. In the roughly two days I've been playing the beta, I've found that there are still good rounds and rounds you could've done better in, but it's never overwhelmingly negative. Failures aren't crushing, they're motivations for the next round. And that's what first-person shooters have been missing: a way to bring all kinds of players into one battlefield without making everyone want to chuck the controller aside in favor of a less...social game. And, yeah, maybe everyone (including myself) has been going on about this game a little too hard. But I can't really blame them, either.